Circulating endothelial cells (CECs) are shed from vessels and enter the circulation reflecting endothelial damage. 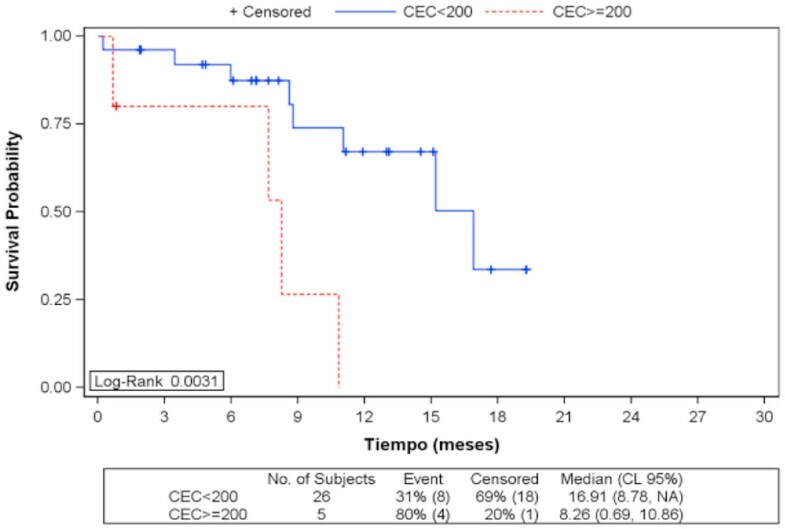 Increased numbers of CECs have been documented in cancer, and appear to correlate with progression of the tumor. Bevacizumab (B) in combination with CT improves progression-free survival (PFS) of first-line treatments and may modify tumor cell intravasation and CEC/CTC levels. Patients received B (10 mg/kg/2 weeks) combined with paclitaxel (P) 150 mg/m2 and gemcitabine (G) 2,000 mg/m2 days 1 and 15 with a cycle each 28 days of therapy, until disease progression, unacceptable toxicity or withdrawal. CTC/CECs were measured in 7.5 ml blood at baseline and after the first cycle of treatment. Enumeration was performed by the CellSearch System (Veridex). Median of follow-up was 16.28 months. Baseline CECs were available for 31 patients. Median value of baseline CECs was 130 (minimum 4 to maximum 1,407) and 60.3 (minimum 0 to maximum 349) in the second determination, P = 0.02. High levels of baseline CECs ≥200 were associated with lower PFS of 8.2 months (95% CI = 0.6 to 10.8) compared with those with <200, PFS 16.9 months (95% CI = 8.78 to NA), P = 0.003. See Figure 1. No difference was observed in OS. Fourteen patients (74%) that had stable disease/partial response decreased or maintained their CEC value. Baseline CTCs ≥5 was associated with a median PFS of 15.2 months (95% CI = 7.6 to 16.9). Twenty-two patients (92%) that had stable disease/partial response decreased or maintained their CTC value. The CTC level was not correlated with the CEC level, P = 0.74. Our study suggests significant correlations between high levels of baseline CECs and poor prognosis. Addiction of B to first-line CT was related to a high reduction of CEC and CTC count.